Throughout the ‘30s the snide, snarling presence of Warner Richmond elicited instantaneous boos from front row kids. Here was a no good lout if ever there was one. Tex Ritter, Jack Randall, Gene Autry, Bob Steele, Johnny Mack Brown, John Wayne and others were in for a rough ride against this scoundrel. According to his death certificate, Werner Paul Raetzmann was born in Racine, Wisconsin (not Virginia as often reported), January 11, 1886. Racine is suspect, however, as, at the time, the family was living in Reedsburg, Wisconsin, half-a-state away. 1880, 1900 and 1910 census records all show the family, including Werner, living in Reedsburg. Other records indicate Werner’s brothers and sisters as being born in Reedsburg. Werner’s father, William Raetzmann, was born in Hanover, Germany, and immigrated to the U.S. sometime prior to 1880 when he is found working as a printer in Reedsburg. His wife, Werner’s mother, was Emilie (later spelled Amelia) Licht (later reported as Light) born in 1856 in Wisconsin. (She died in 1939.) Over the years Werner had seven brothers and sisters. Ewald was born in 1875 and remained a farmer in Illinois. Amandus was born in 1876. Meta was born in 1878. William was born in 1881. By 1930 he was superintendent on a horse farm in Kentucky and later moved to Monterey, California. Alfred, born in 1888, became a movie stuntman in 1919 for about seven years. He moved to Billings, Montana, in 1934 where he owned Al’s Saddle Horse Service when he died in 1966. Paul was born in 1893. He became a policeman in Washington, D.C., and, some reports say, a member of the security force at the White House. He later moved to Clearwater, Florida. Pauline was born about 1890 and became a nurse in Chicago. Some bios indicate Warner attended Virginia Military Institute in Lexington, Virginia. However, VMI alumni records prove this to be inaccurate, probably the result of an invented “studio bio”. He also supposedly held an early job as a brakeman on the Baltimore and Ohio railroad. This may be accurate or, again, it may be studio hype. According to 1910 census records, at age 24, Werner was dividing his time between stock company work in Chicago and as a traveling salesman of musical instruments in Wisconsin. Some reports indicate when stock work became slow, he operated a haberdashery shop in Chicago. Somewhere in these years he changed his name from Werner Raeztmann to Warner Richmond and invented the “fact’ he was born in Virginia. Is it coincidence the city of “Richmond” is in Virginia? As is Virginia Military Institute and the University of Virginia. Eventually, the 5' 11", 179 lb. Richmond came to New York and the old Vitagraph Studios which is where he met and married actress Felice Striker Rose. They had a son, Warner Jr. Felice gave up her career when they married but returned to acting after Warner died. 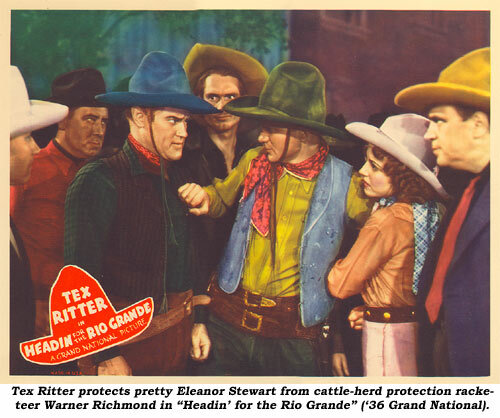 Felice Richmond can be seen in “Fighting Vigilantes” (‘47 PRC), “Rough Riders of Cheyenne” (‘45 Republic), “Trail of the Mounties” (‘47 Screen Guild), “Fighting Mustang” (‘48 Yucca), “Loaded Pistols” (‘49 Columbia), “Son of Billy the Kid” (‘49 Western Adventure), “Cowtown” (‘50 Columbia), “Westbound” (‘49 Warner Bros.), among many others. Richmond first appeared on screen in “The Godmother” (1912). His first western was as a doctor in House Peters Sr.’s “The Great Divide” (1915). In the developing years of silent films Richmond had romantic leads (or second leads) in dozens of films, with critics especially taking note of his work in “Tol’able David” in 1921, the year, incidentally, his son Warner P. Richmond Jr. was born. 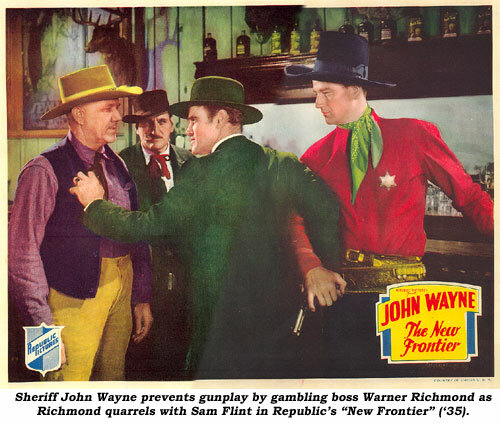 Richmond’s next western role wasn’t until 1930, as gunman Bob Ballinger in Johnny Mack Brown’s historically inaccurate “Billy the Kid”. He was decent in George O’Brien’s “Life In the Raw” (‘33) but turned as vile as they make ‘em in “Smokey Smith” (‘35) as he shot off the finger of Bob Steele’s father so he could steal a ring, then brutally threw lye in George Hayes’ eyes, blinding him. Richmond worked in six serials with his most prominent roles in “Lost Jungle” (‘34 Mascot) and “Phantom Empire” (‘35 Mascot). The die was forever cast. 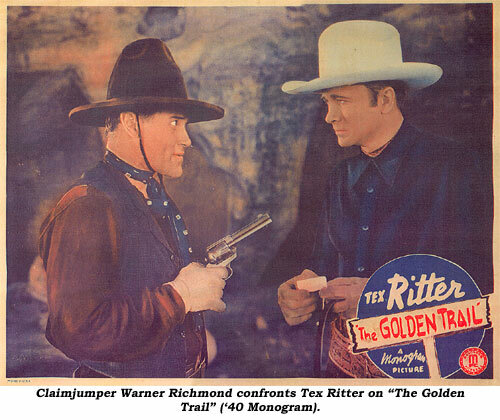 Richmond sneered, sneaked, snatched and snarled his way through over 20 more westerns until he suffered a serious head injury when he fell from his horse due to a loose cinch while filming a chase scene in Prescott, Arizona, for Tex Ritter’s “Rainbow Over the Range” (‘40). You’ll note in the film how his character of Bart Griffin appears and disappears due to his inability to finish the picture. Richmond was hospitalized in Arizona for eight months, then returned home with the left side of his face paralyzed. While sitting and reading, Richmond continually pinched and massaged his paralyzed face until he restored his reflexes after two and a half years, even though his eye still didn’t work well. 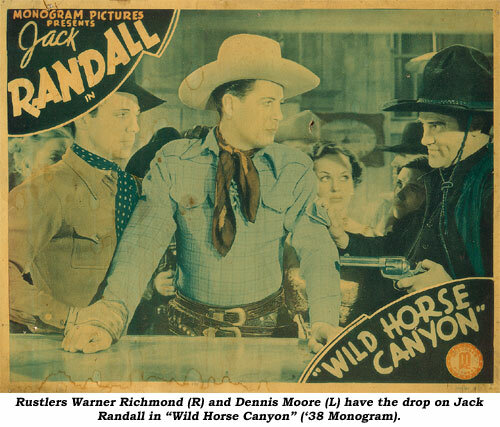 Producer Bob Tansey helped him return to westerns, mean as ever in ‘44 (“Outlaw Trail” w/Trail Blazers), but Richmond made only two more with Eddie Dean before he retired to the Motion Picture Country Home. The life of one of the best of the badmen was cut short at 62 on June 19, 1948, by coronary thrombosis. He was cremated at the Chapel of the Pines.